In writing about a difficult subject like the Holocaust, many authors sensationalize the topic so that the reader is so engulfed by the sheer horror of the event that the meaning behind it is lost. That difficulty is especially apparent when presenting the Holocaust to children. The two books reviewed here avoid that trap. 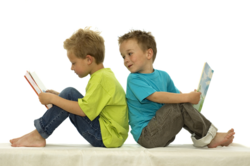 Both books are based on true histories of children who lived through the Holocaust. One is a fictionalized account of one boy's experiences; the other presents eight stories that include historical details about Nazism and World War II. Both treat their subjects in a straightforward manner, with the emphasis, finally, on survival and hope. 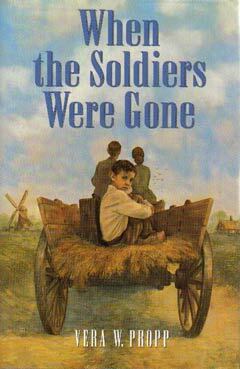 In her impressive first novel, When the Soldiers Were Gone, author Vera W. Propp introduces us to eight-year-old Henk, a young Dutch boy growing up on a farm in 1945. Henk's world comes crashing down around him when a strange, thin, quiet couple arrive at the farm, tell him that they are his real parents, that his name is actually Benjamin, and that they are going to take him away from the only home and family that he remembers. We see through Henk's eyes the heartbreak of being torn from his "mama" and "papa," in reality a courageous Christian couple who took in the Jewish child when his real parents went into hiding. They changed his name and raised him as they did their own son and daughter, except that, unlike their real children, Henk was not permitted to attend school, and when soldiers came from time to time, he was the only one who was expected to hide until they were gone. Little by little as Henk settles in to his new life, small memories start coming back: a favorite book his real mother read to him years earlier, a wool jacket with a stitched-on yellow star that no longer fits him. He attends school for the first time, makes new friends, and comes to feel comfortable with his new life. Eventually, he is able to regain early memories of his parents and can finally accept himself as "Benjamin." In her epilogue, Propp states that the book is based on true events and gives a sense of closure to the story by revealing what happened to the characters afterward. That Benjamin grew up, eventually settled in the United States, and had a family is comforting, as is the revelation that the farmer he had thought of as "Papa" came to be decorated as a war hero for his bravery in hiding Jews from the Nazis. Propp employs a simple, direct style to suggest the viewpoint of an eight-year-old boy. Even young readers, who might not be able to handle, or to even comprehend, most Holocaust materials, would be able to understand and empathize with Henk. Discussions of Nazism and wartime dangers are presented in a non-sensationalistic manner. When the Soldiers Were Gone can be a good resource for introducing upper elementary and middle school children to the difficult subject of the Holocaust. In Witnesses to War: Eight True-Life Stories of Nazi Persecution, author Michael Leapman writes of real-life children from diverse nationalities, religions, and family backgrounds who have one thing in common: childhoods cut short by the inhumane policies and practices of Nazi Germany. From Poland, Czechoslovakia, France, and Holland, the children in this book had to grow up under circumstances that schoolchildren today would have trouble believing. "The stories about the camps are so terrible that, when they first began to be told after the war, many thought they were exaggerated. Was it possible that people could treat other humans with such a lack of humanity? But you only have to look at the pathetic photographs of the survivors of Auschwitz and the other camps, their bodies like skeletons, their bones sticking out and covered by a pitifully thin layer of flesh, to know that the horrors they described really happened; however difficult it is for us to imagine them today." In 1942, Barbara Richter was a 13-year-old Gypsy girl living in Czechoslovakia when she and her family were incarcerated in a concentration camp. She managed to escape, only to be betrayed by a relative of the Gypsy family with whom she was hiding. In the winter of 1943, they were sent to Auschwitz, where Barbara was separated from her friends -- who were immediately sent to the gas chamber -- and moved to a special section for Gypsies at Birkenau next to Auschwitz. The Nazis used different badges to denote to which racial group a prisoner belonged. As a Gypsy, Barbara had to wear a brown triangle. According to Leapman, she endured all sorts of hardships, including being lashed 25 times as punishment for sharing some of her meager rations with another child. She almost died when she contracted malaria (she might have been deliberately infected by the infamous Dr. Josef Mengele) and survived only because another prisoner, a Ukrainian doctor, was able to secretly obtain an antibiotic for her. In 1944, Barbara was among a group of prisoners transferred to Ravensbruck, a concentration camp for Gypsy women in northeastern Germany. Although life in this new camp was initially easier, the now 16-year-old Barbara soon had to endure numerous unwanted sexual advances from prison guards and the brutal beatings that would follow her refusals. One day, when she happened to see a passing truck through a first-floor window, she jumped into it. Fortunately, the driver turned out to be sympathetic, and she was able to escape. Some of the children whom Leapman profiles survived World War II by hiding. For two years, Renee Roth and her two younger sisters posed as Catholic schoolgirls in a convent in Normandy. At the age of 13 in 1944, Renee was reunited with her parents in Paris and had difficulty adjusting to both her parents and her Jewish roots. Joseph Steiner spent the early part of his life hiding from the Nazis, first in the Warsaw ghetto and then with several families belonging to the Polish Resistance. He was 12 when liberated by the Russian army and had not spent a single day in school up to that time. Other children were able to escape from Nazi-occupied lands. Groups such as the Refugee Children's Movement, which brought 9,354 children to Britain between December 1938 and September 1939, saved many children by bringing them to safety and placing them in homes of volunteers. Born in Poland in 1931, Alexander Michelowski was a devout Catholic boy who was kidnapped at age ten by the Gestapo to be part of Germany's infamous "Germanization" program. As part of this program, non-German children were taken from their homes, "examined" by medical doctors to identify those thought to have pure Aryan blood, and prepared -- by being taught to speak German and being given fabricated identities -- to be adopted by German citizens. Alexander was attending a Hitler Youth Camp when the Americans captured it in 1944. Because he spoke perfect German and was training to be a soldier, he was actually made a prisoner of war before convincing the Americans that he was truly a Polish prisoner and not a loyal German subject! Although the histories in Witnesses to War are horrifying to read, there is comfort in the fact that, with the exception of Anne Frank -- whose story is retold in the final chapter -- all of the book's subjects are survivors. In most cases, Leapman includes current photographs and information on their lives. Because of some of its more disturbing details, the book in its entirety may be difficult for children under middle school age, although an elementary school teacher might selectively choose some parts to read aloud to younger students. Witnesses to War, which centers on the effects of Nazi persecution on children, can help make the study of the Holocaust more relevant to students today. The books highlighted this week are available in most bookstores. If you are unable to locate the book, ask your bookseller to order it for you or contact the publisher directly. When the Soldiers Were Gone, written by Vera W. Propp, is published by G. P. Putnam's Sons, a division of Penguin Putnam Books for Young Readers, 345 Hudson Street, New York, NY 10014. 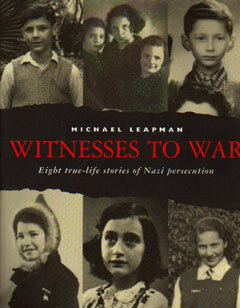 Witnesses to War: Eight True-Life Stories of Nazi Persecution, written by Michael Leapman, is published by Viking Penguin, 345 Hudson Street, New York, NY 10014.